Every few months we like to put together a list of strikers hoping to expand the horizons of fight fans. When there is breathing room in the jam packed schedule of MMA events it’s always nice to unwind and explore exciting new styles through film study. We have racked up quite a list of strikers through our previous articles. Part 1, Part 2, Part 3, and Part 4 are all worth a read. So open up YouTube, break out your notepad, and let's get going. The world of Muay Thai can be hard to follow for anyone who doesn't speak the language. It also lacks a user friendly way of viewing a fighter's record, which makes the sport difficult to follow outside of Thailand. Then there are the names: Muangthai is currently fighting under the name Muangthai P.K Saenchaimuaythaigym but that will change if he changes gym. However it is well worth searching 'Muangthai' every few weeks just to see if he's been up to anything. Muangthai is called the 'King of the Elbow' and it is for good reason. I have often referred to Nate Corbett with this title but where Corbett boxes into his elbows, Muangthai's elbows come from everywhere and arrive in an instant. Often checking both of his opponent's hands or trying to reach behind them with a pincer motion, Muangthai loves to drag his foe's guard forward and either knee them in the gut. Or fold his elbow over behind their guard. But as his opponents move to check these basic attempts Muangthai makes more creative paths with his strikes. Here Muangthai's opponent raises his hands wide and Muangthai's elbow shoots straight to the target. It is tough to throw a 'straight' elbow because the arm does not uncoil to cover distance as it does on a punch but in a few inches Muangthai can get the force he needs to not just cut the opponent but knock him out cold. The beauty of Muangthai's work is that his hand could be on his opponent's forearm, biceps, or even behind their head and he will still find a way to arc in an elbow strike through a position that would have most of us feeling like we're putting our shoulder into an Americana. While knockouts are not as common in Muay Thai as sports which discourage extended clinchwork, and elbow knockouts are even rarer, Muangthai has earned a reputation as a ferocious finisher and you could certainly waste your time in less enjoyable ways than watching this relentless young man ply his trade. For a detailed look at some of Muangthai's earlier work I highly recommend this article from Muay Thai Analyst. The first competitor in the game of bare-knuckle boxing to make the list, Jimmy Sweeney is still only our second bare fisted fighter. Tway Ma Shaung, the legend of Burmese Lethwei, was our first bareknuckle fighter and the knees, throws, kicks and headbutts (which are completely legal under the rules of Lethwei) make Sweeney's semi-legal sport seem a little more tame. For those who have ever tried to learn what's going on in the bareknuckle boxing scene you will know it’s just a mess of people complaining about who won't fight whom—so the game is catching up to professional boxing in that sense—but Sweeney isn't on this list because he's the best, frankly I wouldn't know. He's on the list because he's got a damned entertaining style and he's made it work in every contest I've seen him in even if he is fighting opponents who seem to have little classical boxing ability. It is also a style which highlights the difference between fighting with big gloves, and fighting without. Apparently a competent amateur boxer before he began fighting bareknuckle, Sweeney's in and out footwork shows the difference in the class of competitor he is now facing. Simple, swift retreats are enough to confuse most of his opponents and create the distance through which he can time his counters. Hanging his lead hand out wide he will flick in a left hook to the temple as the opponent moves forwards. While a glove can add weight to a blow, it also adds weight to the arm. Shorter punches which look like a flick of the wrist can become more authorative without the gloves on. The lack of the extra weight on his hands also means that Sweeney can rotate his hands in front of his opponent's vision with impunity, even making the 'wax-on, wax-off' motion of Mr. Miyagi. These are simply applications of the old idea of milling. Circling the arms to hide a quick lead. Flicking jabs have proven a good weapon for Sweeney. While most of Sweeney's opponents are inexperienced enough to run onto his counters it would be fascinating to see what work he could do over a lengthy battle with his jab because cuts are so much easier to open without gloves. While Sweeney does a lot of work to the head, most of his power hitting comes on the counter or after a very cautiously set up right hand against a stationary opponent. Fighting bareknuckle provides more of a threat to a fighter's hands than the opponent's consciousness if he connects with the wrong part of the skull or an elbow. Here Sweeney steps in to dig in a good body shot, note that he throws this with considerably more force than many of his blows to the head. Bonus points if you notice how, amid his arm waving antics, Sweeney's right palm stays up to protect him from the path of his man's jab as he gets into range to deliver the short dig to the body. While the sport of bareknuckle boxing is unlikely to ever get an influx of quality athletic talent and accomplished boxers, it would be fascinating to see how close this form of fighting came to resembling the pugilism of the pre-gloved days if it became an accepted sport. Jeff Fenech won his first professional title just seven fights into his professional career. While we have all been spoiled by the brilliant Vasyl Lomachenko doing the same in just his third fight, Fenech's feat has been made no less astounding. But it is style which gets Fenech in on our list. It isn't always pretty, and it isn't always clean, but Jeff Fenech was a pressure cooker. 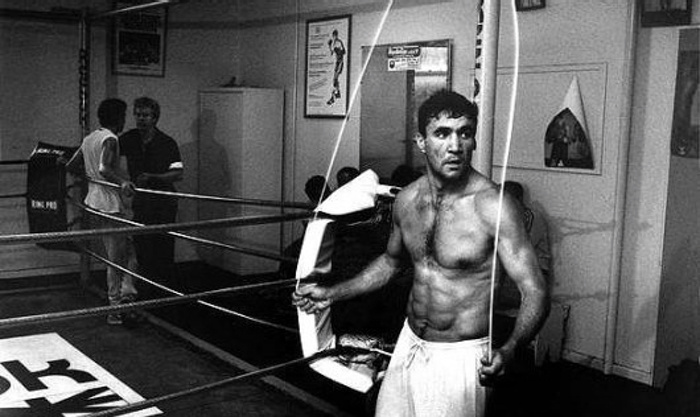 When Fenech got to the inside, especially along the ropes, he could have his way with the best boxers in the business. We would think that kind of in-the-kitchen grittiness unusual on an accomplished amateur today, with amateur boxing often favoring clean, easily seen points scored on the outside. Fenech had some class on the outside too, but he drove his pace best with his head buried in the chest or pressed into the forehead of his opponent and both hands working. The thing about inside fighting is that fighters often make it more complicated than it needs to be. If a fighter isn't doing anything about a particular punch, the infighter can just beat that idea like a dead horse until the opponent does. The great Roberto Duran combined a scientific boxing style with a rougher edge which saw him happily beat a man over the head with the same punch again and again until an adjustment was made. Jeff Fenech was the same, he would sometimes triple or quadruple up on a punch just to make sure the opponent was having to deal with it before he would change target. Never the biggest single punch hitter, Fenech's game was to wear opponents down and have them fall from exhaustion. Nowhere was this more clear than in his fight against Samart Payakaroon, the great Nak Muay turned boxing world champion. Cutting the ring on Samart, Fenech had him sprinting to get off the ropes and by the second round Samart's legs had begun to slow and he couldn't keep Fenech off him. One of Australia's greatest fighters and a terrific example of pressure and pace in action amid slick flurries of work on the inside.